The Syrian military has stepped up air strikes on rebel areas dramatically, carrying out more than 200 in recent days, opposition activists say. The Syrian Observatory for Human Rights said the raids took place mostly in western areas between midnight on Sunday and noon on Tuesday. The UK-based group said there were many casualties, but did not give a figure. 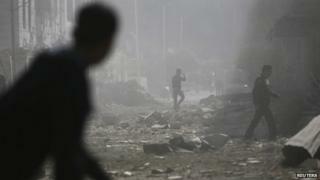 The intensified strikes come as US-led forces continue to bomb Islamic State (IS) militants in Syria and Iraq. US and Arab jets have been attacking IS positions around the northern Syrian town of Kobane, where Kurdish fighters are under siege. In an interview with the BBC, the US special envoy for the global coalition to counter IS defended the airdrops of military supplies into Kobane despite some of them ending up in the hands of the jihadist group. John Allen said only one of 28 bundles of small arms, ammunition and other weapons supplied by the Kurdistan Regional Government (KRG) in northern Iraq might have ended up in the hands of the militants. Shortly after he spoke, the Kurdistan Parliament approved the deployment of about 120 Peshmerga fighters to Kobane. Turkey signalled on Monday that it would allow Peshmerga to cross its border with Syria. It has refused to allow Turkish Kurds to do so. The BBC's Kasra Naji, who is on the Turkish side of the border, says it is unclear when the Peshmerga will arrive. Officials say they will bring heavy weapons - something Kurds in Kobane say they desperately need. The Syrian air force's strikes targeted rebel-held areas in Quneitra, Deraa, the Damascus countryside, Hama, Idlib and Aleppo, the Syrian Observatory said. The provinces stretch from the country's south-west through the capital, Damascus, to the far north-west. The eastern province of Deir al-Zour, where government forces have been battling IS militants, was also bombed over the same period. At least eight people were also reportedly killed on Tuesday in an air raid on a rebel-held town along Syria's southern border with Jordan. The Local Co-ordination Committees, an opposition activist network, said government planes had dropped explosives-laden canisters on Nassib. On Wednesday, warplanes carried out 10 strikes on the towns of Murak and Kafr Zaita, in Hama province, the Observatory said. The Syrian Observatory says the air force carries out 12 to 20 strikes a day on average so the 210 that took place over 36 hours represent a rapid increase. Analysts said the military might be stepping up its air campaign in an effort to weaken rebel groups before they began receiving training and equipment from the US and its allies so that they can take the fight to IS on the ground in Syria. In a separate development, Information Minister Omran al-Zoubi said the Syrian air force had destroyed two of three fighter jets seized by IS. The jets were bombed as they landed on the runway of the Jarrah air base in the eastern Aleppo countryside, Mr Zoubi told Syrian TV late on Tuesday. The air force was searching for the third jet, he added. On Friday, activists said IS militants had flown the jets over Aleppo with the help of former Iraqi air force pilots. Mr Zoubi also said Syrian army and air force had been providing military and logistical support to the Kurdish fighters in Kobane, despite not being part of the international coalition fighting IS.